LAHORE: – Indian Spiritual Leader and Yoga Guru Sri Sri Ravi Shankar arrived in Pakistan on a three-day peace mission crossing Wagah border on Monday. 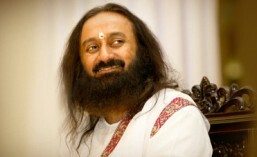 Sri Sri, founder of the “Art of Living” organisation is visiting Pakistan for the second time after 2004. During the course of his visit, Sri Sri would hold talks with business leaders, academicians, spiritual leaders, top political leaders, student organisations and opinion leaders in Lahore, Islamabad and Karachi to strengthen collaborative efforts between the two countries. On his first day, Sri Sri or as his followers call him Guru Jee met with a group of intellectual and business elite of provincial capital including columnist IA Rehman, Director Usman Peerzada, Pakistan Today Editor Arif Nizami and Wateen Telecom CEO Naeem Zamindar in a local hotel. Later in the day, Sri Sri delivered a lecture to students in Forman Christian College University. The Sinclair Hall of FCCU, jam-packed with students and faculty members, warmly welcomed Sri Sri Ravi Shankar as he walked in along with varsity Rector Peter H Armacost. Sri Sri’s solution to make the globe peaceful and violence-free was “to celebrate the differences not fight on them” as he said universe also loved the diversity it had. He was of the opinion that when a person thought that only his way led to heaven and others’ to hell, the thought created problems. He advised listeners to attain wisdom but not at the cost of their innocence. The innocence without maturity and maturity without innocence was worth nothing Sri Sri told students and added that the science of Ayurveda and Yoga had been born in Taxila, Pakistan. Answering a question about promoting peace in South Asia, Sri Sri said “If we spend one-tenth of what we have spent on conflict, we could create a much more prosperous South Asia,” emphasising the urgent need for people-to-people movement and urging the youth to commit to a non-violent and harmonious South Asia, Sri Sri said, “We have spent a lot on conflicts, on escalating conflicts and on destruction of life and environment. Now we have to work towards peace.” He also addressed issues like drug addiction and vegetarianism. Sri Sri’s tentative itinerary during his tour is as follows: inauguration of Art of Living Centre along with Advisor to PM for interfaith harmony, Dr Paul Bhatti; address school students and youth of Pakistan; an evening of Sufi music, dance, knowledge and meditation and visits to places of religious significance including the Badshahi Mosque. He would also hold meetings with spiritual leaders including Gohar Hussain, Bari Imam Makhdoom Syed Nazakat Hussain Shah, Eid Gah (Pir Nakeeb-ur-Rehman), Dr Ghazanfar Mehdi, Chairman International Imam Hussain Council. This is Sri Sri’s second visit; the first one was in July 2004, when he became the first Hindu spiritual leader from India to visit Pakistan. “As an ongoing effort to create a stress-free, violence-free society, The Art of Living’s Pakistani instructors conduct stress-elimination programmes. Eight Art of Living teachers in Pakistan have trained thousands of people through art of living courses.” Says Naeem Zamindar, Chairman, Art of Living Foundation Pakistan. Founded in 1981 by Sri Sri Ravi Shankar, The Art of Living Foundation is an educational and humanitarian NGO engaged in stress-management and service initiatives. The organisation operates globally in 151 countries.